Since its foundation in 1979 the 101 Squadron Association has kept its members in touch and informed through regular editions of the Newsletter. The No 1 issue of the “101 Sqn Association Newsletter” was produced in October 1979 and covered the first reunion held at RAF Waddington in September that year. This first Newsletter was a single type-written page copied on a Roneograph, but nowadays technology has moved on! Initially edited by the Association Secretary the Newsletter gained a dedicated editor in 1993 when 101 Sqn Lancaster veteran Peter Kaye took up the reins. 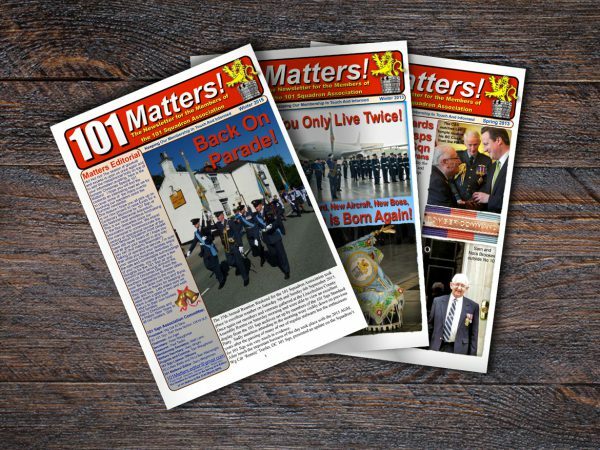 Since 1998 the Newsletter has benefited from the revolution in desktop publishing and home computing and in 2001 was renamed “101 Matters!”, taking its cue from the 101 Squadron motto, “Mens Agitat Molem” or “Mind Over Matter”. It also gained a new editor in the form of Gary Weightman, a 101 Sqn VC10 veteran with a great knowledge of the history of 101 Sqn in particular, and the Royal Air Force in general, who has compiled and published “101 Matters!” ever since. “101 Matters!” is published three times a year with editions every Spring, Summer and Winter. It is a colourful and vibrant Newsletter with items to interest members from all eras of 101 Sqn’s history. It contains information concerning memorial events and the Annual Reunion as well as historical articles and letters from members. Copies are sent out to the Association’s members around the world by conventional post or by email, with increasing numbers now preferring the iPad friendly pdf version these days. Samples of 101 Matters! appear below but to get the latest edition you have to be a Member, so why not sign up today? just £10 per annum! If you are already a registered member, you can renew your annual subscription for just £10 by making a secure payment via PayPal or by cheque. You can also make a donation using the DONATE button below.